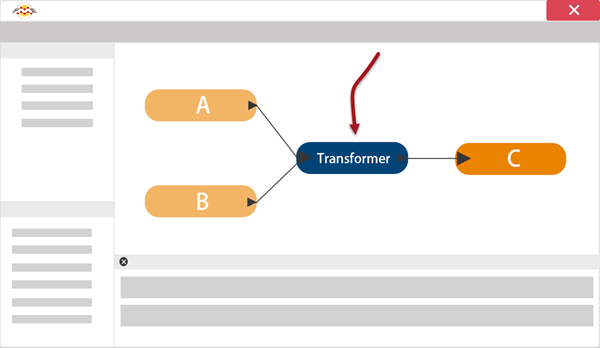 Data Transformation is FME&apos;s ability to manipulate data. The transformation step occurs during the process of format translation. Data is read, transformed, and then written to the new format. Data transformation can be subdivided into two distinct types: Structural Transformation and Content Transformation. Structural transformation is perhaps better called ‘reorganization&apos;. It refers to FME&apos;s ability to channel data from source to destination in an almost infinite number of arrangements. This includes the ability to merge data (as in the image above), divide data, re-order data, and define custom data structures. Transforming the structure of a dataset is carried out by manipulating its schema. Content transformation is perhaps better called ‘revision&apos;. It refers to the ability to alter the substance of a dataset. Manipulating a feature&apos;s geometry or attribute values is the best example of how FME can transform content. Content transformation can take place independently or alongside structural transformation. Mr. Flibble - certified FME jester - here to entertain you. Here&apos;s a riddle, but can you solve it? If you&apos;re in a class, have a group vote!